Pamper yourself with these luxuries filtered showers and showerheads. Already have water conditioner? Choose the Exclusive Oxygenic® SkinCare Shower and get the Five Start Resort treatment right at home. Don't have water conditioner yet? Choose from the most prestigious brand name Aquasana® and Rainshow'r® Filtered Shower and get a healthier, cleanser and more enjoyable shower. Love Bubble Bath? 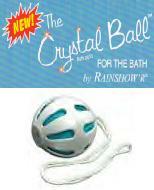 Rainshow'r Crystal Ball Bath Dechlorinator is revolutionizing the way people think of a luxury bath. More bubbles, more healthy, younger-looking skin. Design exclusively for the word's 5 Start Resorts, the new Oxygenic SkinCare Shower by Resort Spa oxygenates, deep cleanses, exercises and revitalizes your skin with a cascade of healthful, oxygen enriched water. We guarantee you'll fell cleanser, fresher and better all day! The Aquasana® Deluxe Shower Filtration System. The Aquasana Deluxe Shower Filtration System with adjustable massage showerhead and replaceable filter uses state-of-the-art technology to provide refreshing and healthy high quality filtered water for showering. 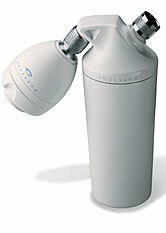 Its unique two stage filter systems removes chlorine, balances pH and reduces soap scum build-up resulting in a revitalizing showering experience. Voted "Best Buy" by Consumers Digest Magazine 2003! The CQ™ -1000 Dechlorinating Shower Filter provides a long lasting solution to the problems associated with exposure to excessive amount of chlorine. Its specially formulated KDF filter media with crystalline quartz produces a more healthier and energized shower that will change the way your hair and skin feel. Massage action Showerhead also available. The RS-502 is a sealed back unit and comes with a back flush adapter so it can be reversed when needed to flush out collected contaminates and particulate matter. It converts Chlorine into a harmless soluble zinc chloride which result in a more healthier shower. Massage action showerhead also available. The Crystal Ball® for the bath is an entirely new concept in the dechlorination of water in bathtubs, bathinettes or any contained vessels. The Crystal Ball Bath Dechlorinator requires no plumbing fixture and the media pouch is replaceable.